Cargill and GM explain why growing in Africa makes perfect sense. "It is a tenet of recession that a company making small, affordable treats - quintessentially, chocolate bars - will fare well. People who cannot afford luxury watches want something to give them some comfort." GM's Vehicle Conversion and Distribution Center in South Africa is a $19-million investment spread over 81 acres (33 hectares) near Port Elizabeth. he cocoa business is West Africa's business. It has been since 1879, when the first the obroma cacao tree was brought from the island of Bioko to the Gold Coast, now known as Ghana. Twenty-five years later, the crop made its first inroads in neighboring Ivory Coast, now the globe's largest producer of the "food of the gods." In Ghana alone, the cocoa bean accounted for more than 21 percent of GDP growth as recently as 2004, since cooling to a still-torrid 17 percent in 2007. Last year was no different, highlighted by the November opening of a new US$100-million cocoa processing facility in the port city of Tema by Cargill. The facility will employ approximately 200 people in the processing of 65,000 metric tons of cocoa per year, with the potential to expand to 120,000 tons. "At these times of global financial uncertainty, it is particularly pleasing to mark an investment that will bring security, confidence and hope to so many and provide a wide range of high quality cocoa powders and other cocoa products for customers globally," said Cargill Chairman and CEO Greg Page at the Tema facility's opening. "Our schedule for construction was by many estimates ambitious, but we successfully met our deadlines," said Leo Winters, head of Cargill's West African cocoa business. Ground was broken for the project in the summer of 2007, after the initial agreement between Cargill and the Ghanaian government was reached a year earlier. The project has notably spanned two presidential administrations in Ghana, which gained worldwide approbation in November when it ran its second successful democratic election in a row, resulting in the ascendancy of John Atta-Mills to the presidency. Government stability is high on the checklist for multinationals looking at Africa, even if they can't address it directly. "Cargill as a private company does not publicly discuss specifics relating to political and regulatory climates," says Leo Winters in an e-mail interview. "What we can say is that in every country in which we operate we look for a stable economy, a clear and transparent legal framework and fairness in how national and international companies are treated." Asked about the site selection for the Tema plant, Winters says the company has had an excellent relationship with the Ghana Cocoa Board (Cocobod) for decades, purchasing a significant percentage of its total global cocoa bean volume from the nation. Concrete plans for the new facility were first broached with the Ghanaian government in 2006. "Tema was chosen as the location because it offers a number of benefits," explains Winters. "Its location means that we have access to a local transport infrastructure, which enables us to easily and quickly transport both unprocessed beans to the facility, as well as the higher-valued cocoa products for export. It also provides us with local access to a good, skilled work force which enables us to successfully develop our operations in Ghana." Helping the decision was the site's location in an industrial free zone in Tema. Winters is careful to point out that Cargill did not receive any subsidies from the Ghanaian government in the construction of the facility. But the free zone status allows for import and export and tax exemptions and incentives from the government that apply to all free zone companies. Separately, government officials plan to double the container-handling capacity of the Port of Tema, which has been Ghana's primary export hub for cocoa products for nearly 50 years. A feasibility study for that expansion, as well as the establishment of an oil services hub at the port in Takoradi, is expected to be complete in March 2009. 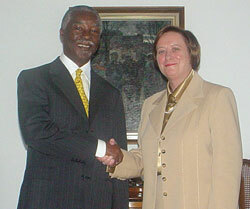 Then-South African President Thabo Mbeki (L) and Maureen Kempston-Darkes, General Motors Group Vice President and President GM Latin America, Africa and the Middle East, shake hands following a 2004 meeting welcoming GM back to South Africa. Cargill's initial foray into the African cocoa business began with the location of operations in Ivory Coast in 1997, followed by production at its cocoa processing plant near Abidjan beginning in 2000. Active on the continent since 1981, Cargill now has African operations in cocoa processing and origination, cotton ginning, commodity processing, trading and warehousing, including offices or production sites in C�te d'Ivoire, Ghana, Morocco, Algeria, Egypt, Kenya, Zimbabwe, Tanzania, Malawi, Zambia and South Africa. Winters says the company is very pleased with the Tema plant's start-up phase, as it offers customers a choice and a suitable complement to the company's existing operations in C�te d'Ivoire. "In both countries, the cocoa crop represents the main source of income for thousands of people," says Cargill's Leo Winters. "High quality cocoa, grown in a sustainable way, is essential to the economies and livelihoods of farming communities in these countries." Ivory Coast in October 2008 also saw a suite of new projects from Swiss cocoa processor Barry Callebaut. The company's investments include a 30-million-euro (US$38.5-million) investment over the past two years in its cocoa factory in San Pedro, creating 75 permanent jobs and several hundred seasonal jobs, and bringing capacity to 105,000 metric tons. The company said the San Pedro investment reflects its strategy "to engage increasingly in direct purchasing of cocoa in the countries of origin rather than over the commodity exchanges, and to process a part of the cocoa in these countries." Callebaut also is establishing a health center in the Ivory Coast region of Goh, near San Pedro, where cocoa cultivation is prevalent. And the company is planting 250,000 cocoa trees in Tanzania, helping some 3,000 small organic farms to boost their yields and incomes. Ghana is not the only African nation seeking continuing economic development momentum with the election of a new president. Rupiah Banda, 71, was elected president of Zambia in a narrow victory in November 2008, immediately pledging to diversify the nation's base beyond copper, which accounts for 60 percent of GDP. Diverse or not, the country's FDI has risen more than fifteen-fold in the past five years, to over $4 billion in 2008.
Business climate improvements were on their way even before the election: In October, the government announced that U.S. firms from an assortment of industry sectors would be eligible for the same free zone benefits Zambia now accords to the Chinese companies for whom such zones were originally created. Zambia has extended similar free zone benefits to investors from Malaysia and India. Chinese investors have flocked to Zambia, part of a global movement of capital from one tier of "emerging" economies to another tier, often driven by resource demand. One of the most recent projects was a pledge in October from Zhonghui International Mining Industry to invest some $200 billion in the country, primarily copper mines and processing facilities, as well as in such sectors as agriculture, retail, tobacco, timber and manufacturing. In January, a non-extractive industry that makes a lot of extract announced a $30-million investment in Lusaka: PepsiCo will construct a bottling plant there that will employ 214 people. At the foundation stone ceremony, President Banda pointed to the project as an example of economic diversification. Two days later, he oversaw the launch of the Lusaka Sub-Zone of the Chambeshi Multi-facility Economic Zone, where Chinese investment has led the way. Investment in infrastructure has already reached $100 million. By 2011, the government expects the sub-zone to accommodate up to 60 enterprises and employ more than 6,000. "In Asia, agriculture R&D investment has increased three-fold over the past 20 years, but in Africa, only by 20 percent (it has actually declined in about half the countries)," he wrote. "Building research talent is one of Africa's most urgent imperatives, and even with adequate investments, this will take time and new vision." "Africa is of utmost importance for us and our business, because the quality of the finished chocolate product is already determined in the country of origin," he said. "It is therefore important for us to give something back to these countries. Poverty is often the root cause of non-sustainable farming practices and exploitative child labor, which is unacceptable. Our efforts in the area of corporate social responsibility start at the very beginning of the value chain, namely with the cocoa growers, in order to find ways to achieve greater sustainability in the complex and fragmented chain that extends from cocoa cultivation to the end-product." Anyone looking for a sunny side to the automotive marketplace may want to look to Africa. General Motors has already done so, seeing its North African and Egypt markets grow by 57 percent and 52 percent, respectively, in 2008, both significantly out-pacing the industry growth rate. 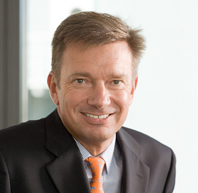 "We are committed to our business throughout Africa and are taking the necessary steps to position ourselves for continued strong performance in 2009 and beyond," said GM African Operations president Stevan Koch. Among those steps in 2008 were a $19-million vehicle conversion and distribution center (occupying more than 3.2 million sq. ft. [300,000 sq. m.] on 81 acres [33 hectares]) and a $22-million pan-African parts distribution center, both built in South Africa. The company also invested the final $4 million of a $28.6-million commitment to a new paint shop at GM's complex in Egypt, which has also recently seen $9 million in manufacturing tooling and product program investment. The 96,878-sq.-ft. (9,000-sq.-m.) paint shop brings with it approximately 400 new jobs. The company's African operations fall under its Latin America, Africa and Middle East Region (GM LAAM), which also includes manufacturing operations in Kenya. The company also has a 30-percent interest in a joint venture assembly operation in Lagos, Nigeria, producing Isuzu N-Series trucks. Because of GM Worldwide Real Estate's alignment with the company's corporate regional structure, explains Sue Rehmus, communications manager for GM African Operations, the responsibilities of GM LAAM Director of Worldwide Real Estate Roch X. McClain are 100-percent aligned with the goals of the Group VP of the Latin America, Africa and Middle East, Maureen Kempston Darkes, and her leadership team. Asked about the company's site selection approach to these projects, Rehmus says by e-mail from her office in Port Elizabeth, South Africa, "Generally speaking, any construction project we initiate, regardless of size, comprises a multi-disciplined range of professionals, both internal to GM and external. Internally we engage representatives from various functions including, but not limited to, business operations, finance, legal, real estate, engineering (mechanical, electrical, environmental, etc. ), facilities, procurement, etc. Certain projects based on their scope may require the use of an external team of professionals including, for example, consulting engineers, architects and surveyors." The greenfield Vehicle Conversion and Distribution Center (VCDC) in South Africa is an example of the latter. She says the greenfield project "presented unique issues to consider before, during and after the project and, while managed internally, exceeded our capacity to execute exclusively with an internal team." The project proposal was approved in December 2006 after six months of intensive pre-planning, she says. The procurement process was completed and ground was broken in April of 2007. And GM employees began occupying the new facility on May 5, 2008. "The building site was considered an ideal location because it is very close to a main railway and major road network, it was a sufficient size of land with room for expansion, utility services were already available and accessible and it was a piece of property the company owned," says Rehmus. "The site attributes of this location will provide GMSA a long term strategic advantage in the transportation of GM vehicles throughout the region in a cost-effective and efficient manner." Among the local infrastructure partners on the project were Transnet, which handles the railways in Port Elizabeth, and the Nelson Mandela Bay Municipality roadworks department, "to ensure a plan was in place to handle the significant traffic flow increase efficiently," says Rehmus. "While every project is unique, some incentives attractive to GM include zero/low percent interest loans, various tax savings, property tax abatements and valuations, free/reduced cost service provider agreements and facility services and various work-force training assistance," she says. In addition to GM's projects, Egypt has seen a pronounced upsurge of corporate projects over the past couple of years, including a number of glass and other building materials plants. Asked to characterize that nation's business climate, Rehmus refers to the World Bank's 2007 citation of that country as the world's most aggressive reformer. "This liberalization of the Egyptian economy has clearly led to substantial growth and contributed to recent record vehicle sales," she says. Asked about business climate factors across the continent, Rehmus says, "Each country in Africa is different and presents unique opportunities and challenges. It is a volatile environment with challenges relating to transparency, regulations, government policy, etc. Over time, these situations are improving, especially in countries such as Namibia, Botswana, Angola, Egypt and South Africa. However, one must be agile to successfully do business in Africa and be willing to adjust strategies as the economic and political landscapes change. Often times, this strategic change must be done very quickly and on short notice." "We install facilities to manufacture vehicles in markets with a large enough industry to support the local assembly," she says. "We also look for a duty and tax protection environment which provides appropriate incentives to make a local assembly facility economically viable. In our experience, relatively few countries in Africa meet those conditions." ©2009 Conway Data, Inc. All rights reserved. SiteNet data is from many sources and not warranted to be accurate or current.